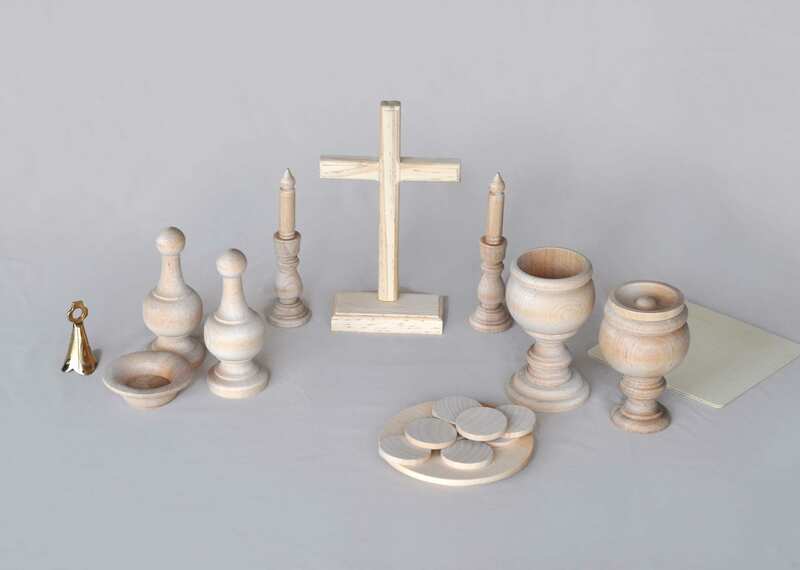 DIY Wooden Catholic Mass Kit - includes pieces to make a 4 1/2" chalice and ciborium with lid (these will need glued in 3 spots), a standing cross and a pall (that will both need sanded), a paten, several 1 1/2" inch wood "hosts", wooden candles with candle holders, two "cruets" (finials), a small finger bowl, and a small brass bell. 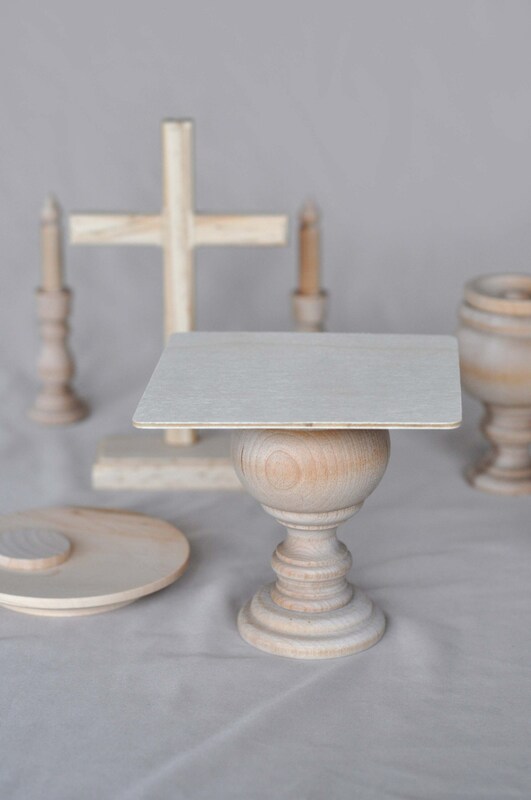 All of the wood parts are made of unfinished birch wood except for the cross (which is pine). The pictures show the Mass kit with a 4 year-old boy. 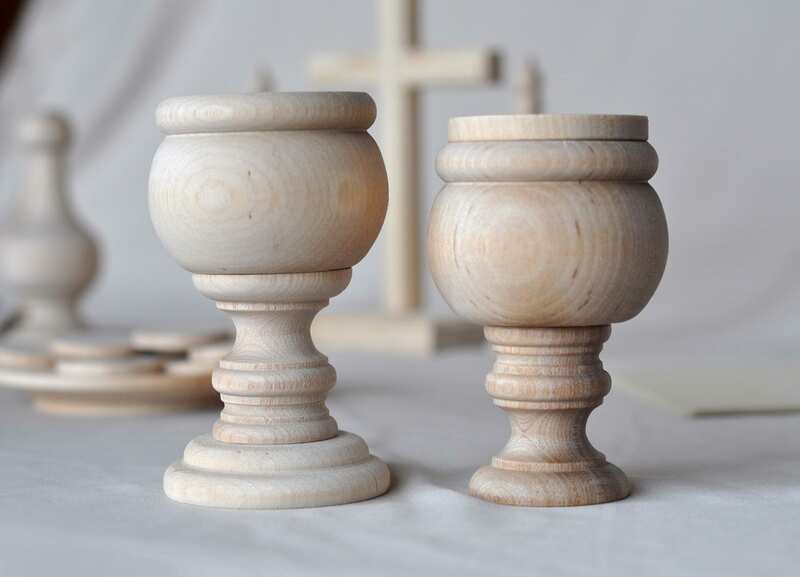 ***This kit is easy to put together - it just requires gluing 3 pieces and sanding. ***Tools required are just sandpaper and some wood glue. 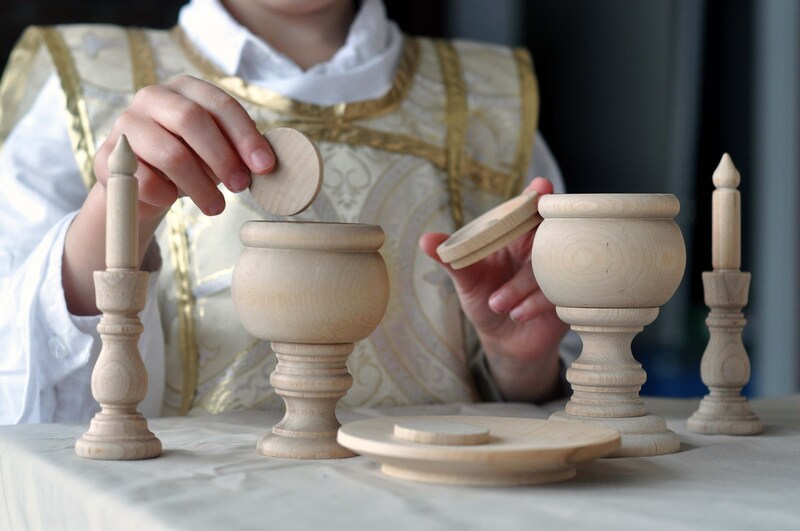 Once it is complete, it's the exact same as the finished wooden Mass Kit that I sell. I started selling this DIY version of my Mass Kit (www.etsy.com/listing/253743637/wooden-mass-kit) because my oldest is a hands on kind of guy. He loves figuring things out and and he loves work projects. 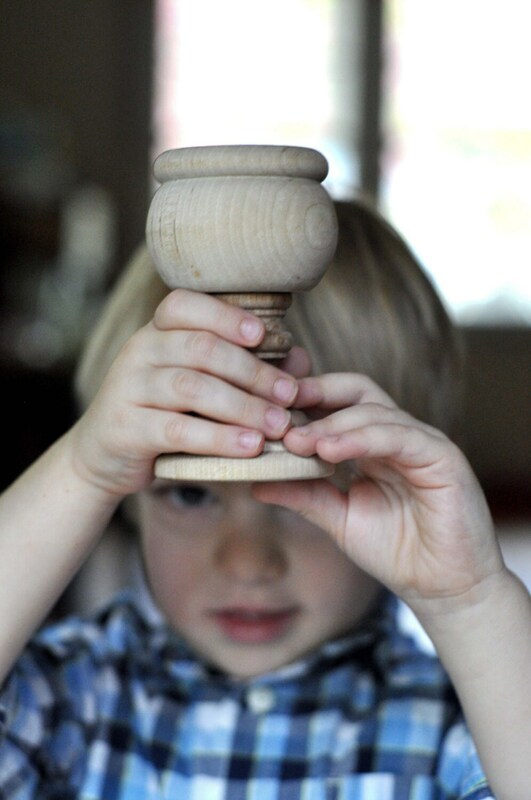 I'm always looking for hands on ways to draw him into the faith so I hope for this to be the first of many DIY projects where kids have the opportunity to build catechetical toys and educational tools themselves. I want kids to be able to take ownership and enjoy working to help provide something really important for their family. As an added bonus, you get a discounted product. Orders are mailed in 2 weeks or less and shipped through USPS. These Mass kits are automatically shipped 2-3 day priority since they weigh more than one pound. If you have a special date that you need them by please let me know and I can probably rush your order. If you are purchasing multiple items I very well may be able to combine shipping and save you money - especially if you are shipping to the US and your shipping total is greater than $13. International orders are usually $20-40 dollars and combining shipping will save you a ton. Please just send a note in the comments of checkout to ask about it. Or you can certainly ask for a shipping estimate by contacting me before your order. If you want to see more pictures, new artwork as I make it, or know when I come up with new toys/resources, you can follow me on facebook. Sometimes I post special offers too. I have the best customers ever and I don't mind taking care of you at all. If you ever have a question, idea, or concern about any of my items or your order please don't hesitate to get in touch! Please keep us in your prayers! I have four kids ages 9 to 3 and they all love to play with the mass kit. 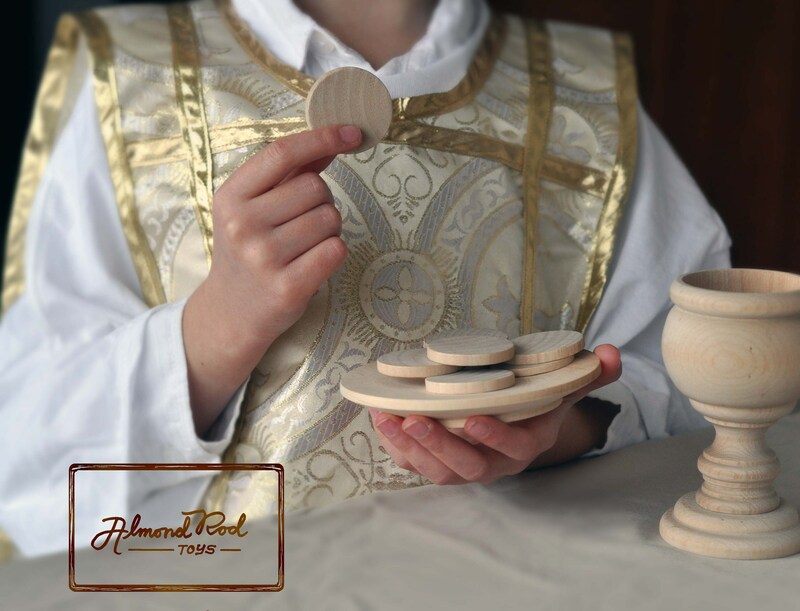 A beautiful tool to inspire kids to a deeper understanding and love of our catholic mass. Thank you. My kids love this kit and play with it pretty much every day! The DIY instructions were easy to follow. Can’t wait to put it together.